File Encryption is something, which is understood to be important by many people, but still not used because they think it is too geeky and complex. They often do not feel comfortable working with encryption software. 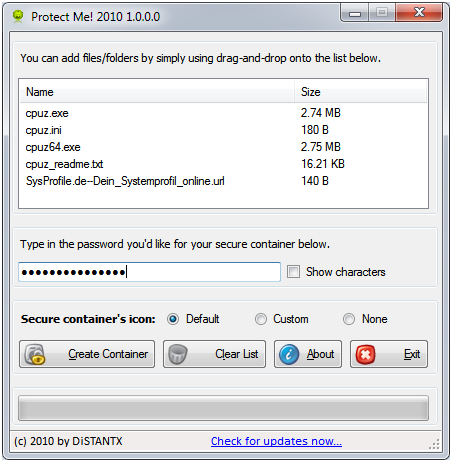 Protect Me 2010 is a freeware File Encryption Software, which allows you to quickly encrypt and decrypt your files and safeguard them with a password of your choice. Protect Me 2010 uses industry standard SHA1 for password security and AES for the encryption protocol. Protect Me! 2010 creates secure executable (.exe) container files to which you can add any files and directories you want to! Your files will be stored securely inside the container file. The container file can either run or extract your files once you typed in the right password. Easily password-protect any file you want! The result will be just a few KB bigger than the encrypted files themselves! Your data is really secure! The container file is compiled at runtime! A useful Tool for your data and PC Security.